“It was a pity that with such a head the child had not been born a boy, destined for a life of study. A girl with such a head, when the child is very young, is like the ostrich…a bird that has been given wings but will never fly.” This is what people in the shtetl thought about intellectually curious girls. I learned from my research of women in the shtetls that the ideal woman was submissive, docile, decorous, retiring, modest, patient and utterly devoted to family. She had no personal ambitions. In her own right, the woman was nothing except to bear and socialize children, and to provide a harmonious home conducive to men’s study and prayer. When I began writing The Unveiling, one of the titles I considered was Wings of the Ostrich, an ironic title to highlight my mother’s strength of character. Key to her life’s story was her love of education, the disappointment she felt when it was denied her and the level of her determination to help her children receive higher education. Instead, I chose the title The Unveiling to better encompass the theme of the book, the uncovering of family secrets. However, many readers have commented that they see both my mother and grandmother as heroines whose resourcefulness and personal achievements secured their family’s survival and hope for the future. Rather than having wings that would never be used, they had strong shoulders upon which their children and grandchildren could stand as they strove for a better life. 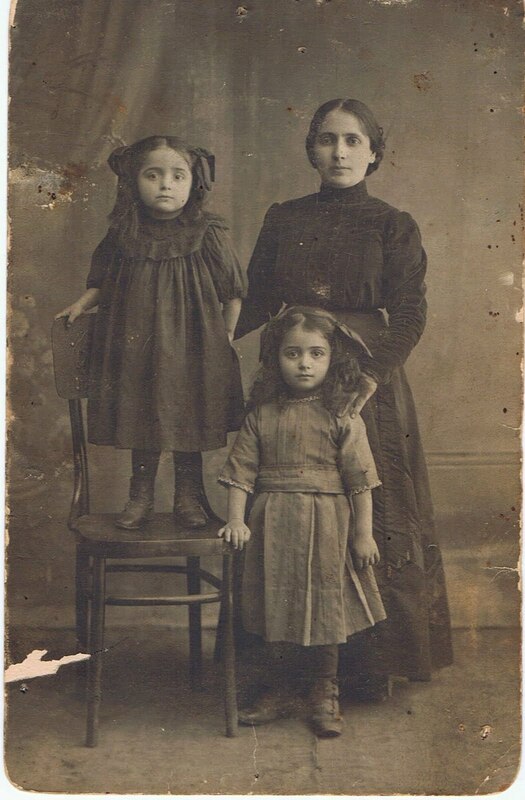 Photo taken in Skvira shows my mother standing on chair, her Mother standing beside her and her sister standing in front. How Do You Get a “Home Town Bounce” Marketing Your Book? This is another question I've been asked, and it is not an easy one to answer. Even though I spent my childhood and early adult life in Pittsburgh, and still have friends and relatives who live there, I’ve spent more years in Toronto. So what is my "home town?" I got my inspiration for the characters of The Unveiling from my family, with the result that much of the book is set in Pittsburgh. The story reflects the history of Pittsburgh’s immigrants. (Picture on left shows my grandmother, Anna Rubin, becoming a U.S. citizen. Standing with her is H.J. Heinz.) So I have been hoping for significant interest and a reasonable number of readers in Pittsburgh. To date this expectation has been partly realized. Family members who live in Pittsburgh have been my best customers and PR people. So have close friends and colleagues, who have not only read the book, but ordered extra copies to pass along to other friends and associates. A few old high school friends heard about The Unveiling, read it, reconnected with me and encouraged others to read it. Other acquaintances have promised to speak with people they know in various organizations, encouraging them to invite me to speak about the impact of mental illness on families. The biggest “home town bounce” has been the positive review in Pittsburgh’s Jewish Chronicle in late March 2010. I am aware that some people I know provided The Chronicle with review copies, so my carefully worded pitch email probably was not the reason for the review. And another “bounce” came during the past week when the owner of Bradley’s Books in Pittsburgh, after speaking with my cousin, Mel Solomon, decided to carry copies in two of his stores and to invite me to do signings. I’ve had a few disappointments, probably because I am not presently a Pittsburgh resident. Other than the Chronicle, the Pittsburgh news media has shown minimal interest in The Unveiling. And the Carnegie Library of Squirrel Hill resorted to rigid national library policy as an excuse to rule out my making a personal appearance, despite welcoming “local” authors in the past. More than getting a “home town bounce” in marketing The Unveiling, I’ve had a “family and friend bounce”. Relatives and friends give copies to associates, and this leads to invitations for me to speak to groups…in Toronto, Florida, Georgia and Maryland so far. As an author who is responsible for my own book marketing, I’ve been following advice from other authors and public relations experts offered on the social media. Going after that “home town bounce” has been one piece of advice, and it is worth following, but it is only one part of a much more complex challenge. My Air Canada direct flight to Pittsburgh on April 23rd was smooth and uneventful. I had to wait only five minutes for the bus between the airport and Carnegie-Mellon University where one of my hosts, Joel Merenstein, was waiting to pick me up. The weekend began with Nancy Merenstein’s delicious Friday night dinner followed by friendly conversation. The rain on Saturday did not spoil lunch at the Casbah Restaurant with Emil and Barbara Trellis. They have been among my strongest supporters since I shared an early manuscript of The Unveiling with them. They continue to go out of their way to bring the book to the attention of potential readers and reviewers. Saturday night dinner was with close cousins at the home of Cyma and Jerry Dolan. My past visits with these cousins have always been special as we share memories of past joyful events and catch up on more recent activities. This get-together was remarkably different in a positive way. During the last few months the cousins had read The Unveiling, and they say it gave them new insights into my mother’s courage. They wanted to know more about my father’s illness and felt comfortable asking about him. We all agreed that in the past people in the family did not talk about him or his mental illness. I felt lifted to another level of liberation as I shared more details with these cousins I care for so much. Sunday brought a big surprise when I got the email from Lisa, my daughter, telling me she was flying to Pittsburgh to help celebrate the 100th birthday of my Uncle Jack Rubin, my father’s only surviving brother. Lisa and I were both delighted to see him looking well and able to share happy greetings with everyone. Being together with Uncle Jack, my cousins and their kids and grandkids and others who are close to the family was uplifting. (That's Jeff, Larry, Kenny Rubin and me in the photo.) My conversation with a distant cousin, whom I met for the first time, led to some information about my father that I had never heard before. I made one last connection on Sunday night. Marlene Rebb, sister of Ann Stone, an old friend from Peabody High school, invited me to dinner along with Shirley Katz, who had been the Executive Director of the Foreward-Shady Apartments when my mother lived there. Shirley was enthusiastic about The Unveiling, and liked the idea that she actually inspired a character in one scene in the book. Not only did she remember the occasion, but she also recalled what she had said. Shirley and Marlene both promised to help spread the word about The Unveiling among their Pittsburgh network. The dinner was a delight, and the memories of my mother shared by Shirley put the finishing touches on a memorable weekend.